Most likely you are here because you want to know who I am, where I come from and perhaps a bit more about what I do. My name is Stefanos Alexiou, a name of Greek descent. My father was born and grew up in Greece before moving to United States where he met my mother. I was born in San Diego, California in June 12, 2000. I have a brother one and a half year younger and currently I’m attending 8th grade in Middle school. I started playing guitar when I was 9 years old because I wanted to participate in my elementary schools yearly Christmas show as a 4th grader, where I eventually played a not so bad version of Slash’s “Godfather Theme” just a couple weeks after my first encounter with a guitar. For the following year as a 5th grader, I played Eddie Van Halen’s “Eruption” at the school’s Christmas show where a crowd over 1000 people came to a stand. Right and then I realized that being a guitar player was what I really wanted to do for the rest of my life. I started watching videos and listening to many live versions of my favorite songs while I was teaching myself to play along as well as trying to develop my ear. Right after school until I went to sleep and the whole day during weekends and vacations my guitar was always on my hands. To date I have covered, my own way, hundreds of my favorite songs, including a few remakes such as “Planet Caravan” and “Lullaby“. In 2012 I had a couple one hour coaching sections with the shredder and master of arpeggios Tony MacAlpine but other than that whatever I know is what I have learned by not being afraid to try it myself. 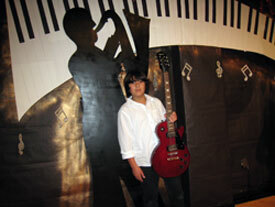 My first YouTube hit was that performance as a 5th grader of the “Eruption” solo which was followed in the summer of 2011 when my version of “Little Wing” got first noticed by Joe Bonamassa who included it among his favorite videos on his YouTube channel and then it was featured and broadcasted worldwide in Steve Vai’s Guitar TV channel. My versions of “Voodoo Child” and “All Along The Watchtower” were also featured and broadcasted in Steve Vai’s Guitar TV channel. As a result I continued to make and upload cover videos on YouTube which today they have over 3 million views. I’m very lucky and blessed at the same time and I owe you big time for caring, sharing and supporting what I do. Words cannot express my gratitude to you… THANK YOU FOR EVERYTHING!!! Currently I have been doing some solo live shows with most notable a kids expo & fair at the Del Mar Fairgrounds and most recently at the Voodoo Lounge stage at the world famous House of Blues in Hollywood. Recently I was noticed by Bob & Coe from 101 KGB radio’s “Bob & Coe Morning Show” where they were gracious enough to introduce me to the station’s radio listeners. On August 31st Bob & Coe invited me to perform during their live broadcasting from the Qualcomm stadium prior to the annual Sky Show. That was an experience by itself and I’m so thankful to both of them plus the KGB radio for all of their support. Early in 2013 myself and Brian created a SoZo-Led, a Led Zeppelin tribute band as a thank you to Jimmy Page who’s my guitar hero where of course I played the lead guitar. Unfortunately by the mid of the year I had to leave the band since during the time that we were rehearsing I didn’t see us going anywhere fast. Some amazing things have happened and are planned to happen in the very near future. I’m working on a few remakes of older but loved songs, producing my own original music and some more live shows. I’d love for you to come and say hello on one of my upcoming shows, but if you cannot make it, you can always connect with me on Facebook, Twitter and YouTube.